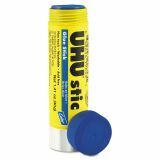 UHU Stic Permanent Blue Application Glue Stick, 1.41 oz, Stick - Glue stick forms a strong, long-lasting bond with just a single stroke. Solvent-free, acid-free design assures that your precious photos and memories can be cherished for a long time. 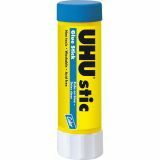 UHU Glue Sticks are safe for child use because they are nontoxic and conform to ASTM D-4236. 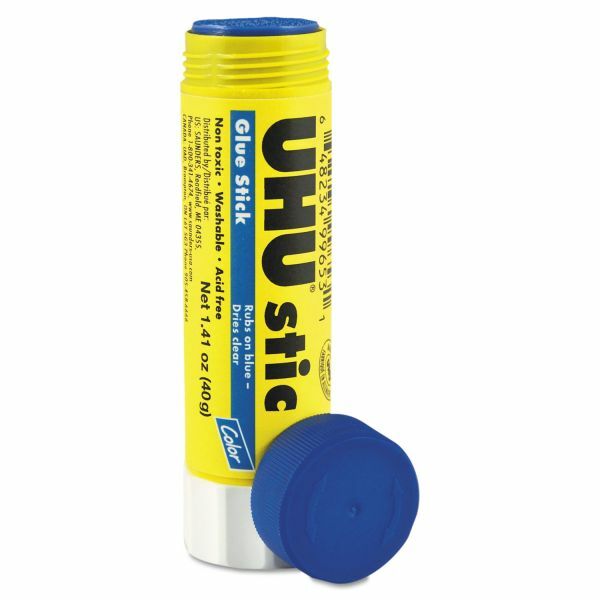 UHU Glue spreads easily and sticks immediately. 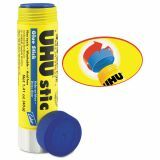 Ideal for all kinds of crafts and projects, the glue goes on appearing in color for precise application and dries clear. Less moisture in the glue stick ensures that your paper won't wrinkle or bubble and will lie smoothly giving your creation a professional touch. Unique patented airtight screw cap prevents the product from drying out. Use glue on paper, cardstock, cardboard, fabric, envelopes and photos.